Capalbio is an alluring town in Southern Tuscany, which stands at the top of a hill covered with typical Maremman brush. The town developed around the Castle of the Three Fountains of Rome (8th century) and was owned by the Aldobrandeschi family in the Middle Ages. Later it became the property of the Conti Orsini and in 1416 was annexed to the Sienese Republic. Subsequently, the land was assigned to Cosimo de’ Medici, marking the beginning of a period of slow but relentless decline. When Capalbio fell into Lorraine hands the town lost its independence and its society began to disintegrate. 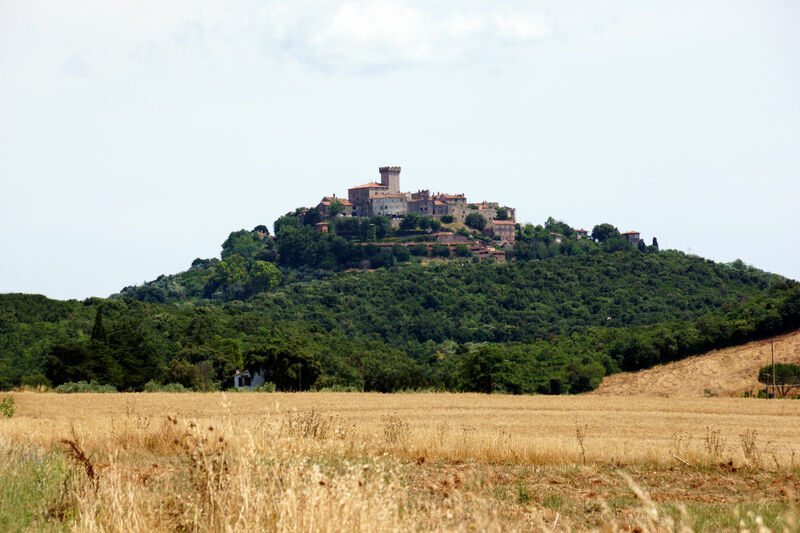 This situation proved ideal for bandits, who terrorized the Maremma for years. Tradition has it that the famous Maremma bandit Tiburzi spent most of his time in hiding in Capalbio: his endeavors have become so legendary that they are still remembered today. Walking around Capalbio today means discovering a town that, despite its swings in fortune, has kept most of its ancient medieval layout intact. There’s something very moving about strolling around the centuries-old walls: you can walk almost the entirety of the watchway while looking as far as the horizon across the surrounding countryside. Check out one of the gates, the Porta Senese, which still features original heavy wooden doors dating to the 1400s. Because of its elegance and relative closeness to Rome, over the years Capalbio has become a holiday destination for the elite, drawn by the evocative atmosphere in the town streets and the ancient castle that dominates the valley below, from which you can glimpse the beautiful beaches of Chiarone, Macchiatonda and Torba. While in the area it’s worth taking a walk in the wonderful nature reserve that surrounds the shores of Lake Burano, perfect for year-round birdwatching. Capalbio’s appeal has grown over time also thanks to the Capalbio Cinema Short Film Festival, which is held every year in the first half of July, welcoming leading Italian and international celebrities. Near Garavicchio a visit to the Tarot Garden is a must, created by top artist Niki de Saint Phalle.